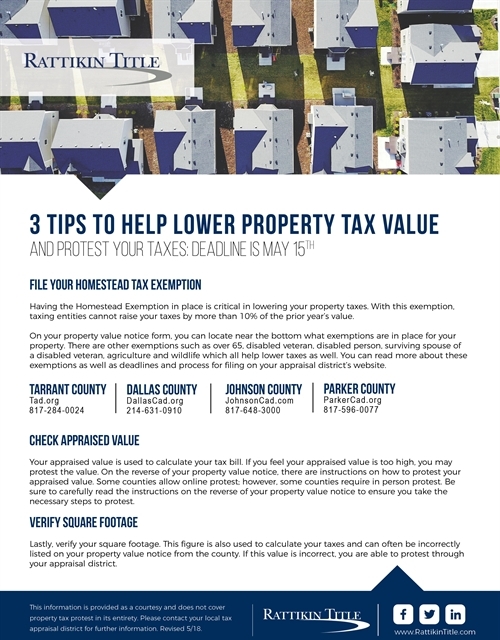 Having the Homestead Exemption in place is critical in lowering your property taxes. With this exemption, taxing entities cannot raise your taxes by more than 10% of the prior year’s value. On your property value notice form, you can locate near the bottom what exemptions are in place for your property. There are other exemptions such as over 65, disabled veteran, disabled person, surviving spouse of a disabled veteran, agriculture and wildlife which all help lower taxes as well. You can read more about these exemptions as well as deadlines and process for filing on your appraisal district’s website. Your appraised value is used to calculate your tax bill. If you feel your appraised value is too high, you may protest the value. On the reverse of your property value notice, there are instructions on how to protest your appraised value. Some counties allow online protest; however, some counties require in person protest. Be sure to carefully read the instructions on the reverse of your property value notice to ensure you take the necessary steps to protest. Lastly, verify your square footage. This figure is also used to calculate your taxes and can often be incorrectly listed on your property value notice from the county. If this value is incorrect, you are able to protest through your appraisal district. This information is provided as a courtesy and does not cover property tax protest in its entirety. Please contact your local tax appraisal district for further information. Revised 5/18.